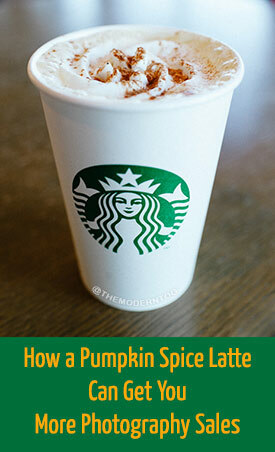 People who love the Pumpkin Spice Latte will justify going to Starbucks more often while it’s available because they can only get it for so long. It wouldn’t be a big deal otherwise. I mean, let’s face it. Starbucks could get the stuff they want year-round to offer the drink all year if they wanted to. But instead, by only offering it during a certain season, they are creating a desire for people to get it now before it’s gone that can’t be replicated if they offered it all the time. This is Scarcity. Scarcity is simply a fancy marketing term for “limiting” something, and it’s a HUGE driver of sales. There are hundreds of products that you could be offering your client. Which one could you make into your own personal Pumpkin Spice Latte? Maybe it’s metal prints that they can only order before Christmas. Or mini accordion albums. Because it is a limited item, you can also charge a premium for it. Pick a specialty item or two that you want to promote at specific times throughout the year and see how it goes. Make sure you tell people exactly when it will be available for order, how long it will be available, and what they need to do to order one. Then watch the sales come in. 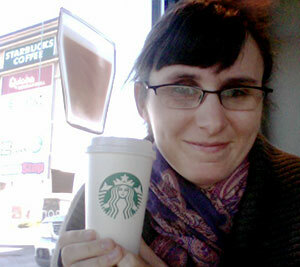 Me and my Pumpkin Spice Latte. YUM! Now, let’s say a Pumpkin Spice Latte Lover goes into Starbucks in June when it isn’t supposed to be available and begged for their favorite drink. Even though Starbucks could theoretically make it for them, they’d lose out during the limited promotional time that it’s offered because that person would know that they could get it anytime and wouldn’t feel so compelled to go in every day during the fall to get one. It’s absolutely essential that you stick to your guns and only offer your special product during the times you say you will. Yes, I know you can order it at any time. Yes, it’s very difficult to turn down sales. But if you want to start creating buzz and really sell a lot of the item, let your client know that they are only available during a certain time of the year and that you’ll allow them to buy it at that point. Making sure your clients know about it! The key to making this work is making sure that each of your clients from the past year knows about your promotion or it won’t matter at all. Since you can’t rely upon services like Facebook to actually tell any of your clients about it, it’s absolutely essential that you have a client email list that you can use to send them information about the promotion. I highly recommend AWeber for photographers, even though it’s not free like some services because it has invaluable advanced features that will bring you lots of extra sales in the future that other free services like MailChimp do not offer with their free accounts. For less than $20 a month, it will be your greatest asset and is some of the best money you can spend on marketing and advertising. It’s also one of the least-used by photographers, which is truly a shame. I’ll be writing more about this throughout the next few months. If your clients don’t hear about your promotion, it’ll be an utter failure. So, how could you incorporate scarcity into your business? I’d love to hear your ideas, so please leave a comment below and share!